Aloha! 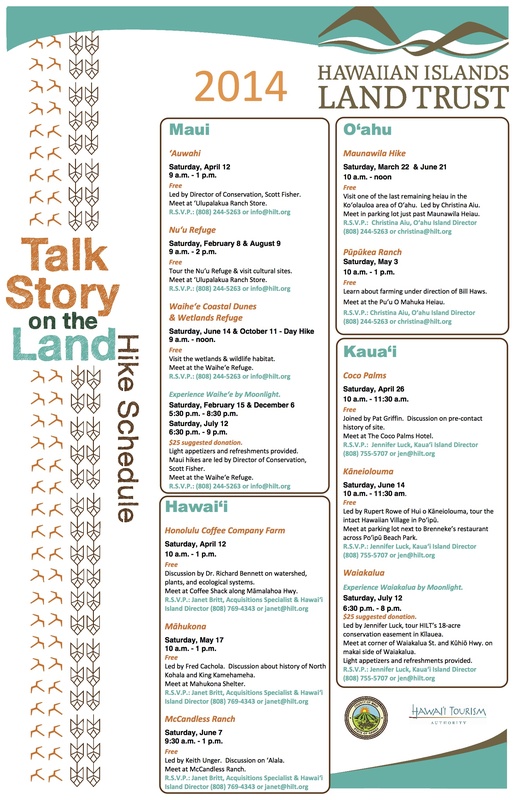 Please join us for a tour of Pupukea Ranch on May 3, 2014 from 10:00 AM to 1:00 PM to partake in a new series of educational hikes sponsored by the Hawaiian Islands Land Trust (HILT): “Talk Story on the Land”. This is a great opportunity for you to ask any questions or concerns you may have regarding the protection and use of these lands. You will also have a chance to meet Bill Howes from Kolea Farms, and learn about his efforts to establish a permaculture farm on site. The hike is completely FREE! RSVP: Christine Aiu, Oahu Island Director, at (808)244-5263 or [email protected]. We’re meeting at Pu’u O Mahuka at 10:00 AM sharp. We hope to see you there!